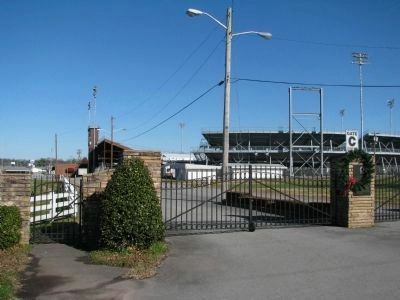 This 90-acre tract is home of the Tennessee Walking Horse National Celebration - "The World's Largest Walking Horse Show". On July 17, 1939, a non-profit association was chartered to conduct a national celebration to honor and exhibit the Tennessee Walking Horse. By its 50th anniversary, the show had grown from its initial 3-night competition and an estimated 8,000 spectators to 10 nights and a paid attendance in excess of 231,000. Location. 35° 29.327′ N, 86° 26.95′ W. Marker is in Shelbyville, Tennessee, in Bedford County. Marker is on Jessup Place, on the left when traveling north. Touch for map. Marker is at or near this postal address: 1110 Evans St., Shelbyville TN 37160, United States of America. Touch for directions. (approx. 0.6 miles away); Henry Brevard Davidson (approx. 0.7 miles away); Tribute to Revolutionary War Veterans of Bedford County, Tennessee (approx. ¾ mile away); Tribute to World War I Veterans of Bedford County, Tennessee (approx. ¾ mile away); Fighting in Shelbyville (approx. ¾ mile away); Tribute to Veterans of Bedford County, Tennessee (approx. ¾ mile away). Touch for a list and map of all markers in Shelbyville. Related marker. Click here for another marker that is related to this marker. 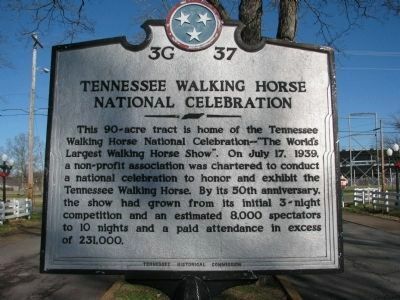 A marker for Strolling Jim, the first World's Champion Tennessee Walking Horse. More. Search the internet for Tennessee Walking Horse National Celebration. Credits. This page was last revised on June 16, 2016. This page originally submitted on December 26, 2009, by Tom Gillard of Tullahoma, Tennessee. This page has been viewed 1,811 times since then and 8 times this year. Photos: 1, 2. submitted on December 26, 2009, by Tom Gillard of Tullahoma, Tennessee. • Kevin W. was the editor who published this page. Editor’s want-list for this marker. A wide view of the marker and the surrounding area together in context. • Can you help?